Spending time with family… isn’t it a good idea? Yes! And depending on what activities you choose, it can be filled with lots of joy and fun. But with today’s economy and limited funds, parents are not always able to shower their kids with expensive toys and video games. So instead of just sitting home and watching TV, how about coming up some creative ideas? Board games: One of the best entertainment ideas is playing board games. There are so many different games available for all ages. Some of my favorites are monopoly, operation, break the ice, life, battleship, and so much more. Playing games allows your family to interact and enjoy a challenge. 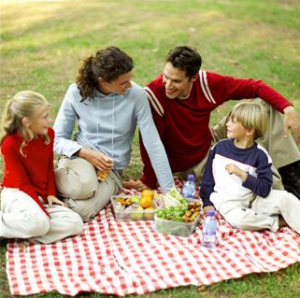 Picnics: This is as simple as packing a few sandwiches and snacks and going to a local park. Bring a frisbee, a kite, or a ball and glove and have some fun after you eat. Museums: Museums are great for older children where you can enjoy the different artifacts and cultural collections. Kids can learn about the history and science. Some museums even have free days so be sure to look into that. Rent a Movie: Watching a movie together as a family is a great inexpensive entertainment option. Purchasing tickets to go the movies can be costly especially if you have multiple children. So make some popcorn, dim the lights and increase the volume. Let your family members enjoy a fun family friendly movie. Beach: The beach is a perfect place to enjoy a nice warm sunny day. Enjoy some swimming or boogie boarding. Bring lunch. Go for a long walk. There is nothing like a relaxing day with your family at the beach. Zoo: The zoo is always a hit with small children. Some zoos even have days where you can get tickets for a reduced rate. Sports: Get active by doing some outdoor sports activities such as: basketball, football, tennis, soccer and more. Put on your safety gear and get some energy out! Cooking / Baking: Get your family involved when it comes to cooking. Prepare a meal together. Bake a cake. Make some cookies. Kids love to use cookie cutters and sprinkles. And don’t forget the best part – EATING them! Old Photos and videos: Take out the old videos and photos and reminisce together. These tips can keep your family happy and entertained without spending fortune. This guest post was written by Jessica Williams, a tech writer from USA who is into Finance. Catch her @financeport. Payday loans are instant loans which are helpful when you run short of funds. We love games too! I will have to check out Suspend.